Armchair fiction presents extra large paperback editions of the best in classic science fiction novels. 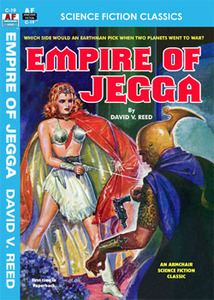 “The Empire of Jegga,” written by David V. Reed, is perhaps one of the most underrated, if not one of the best science fiction novels of the 1940s. It is a grand science fiction tale about a young millionaire’s attempt to launch his own private moon expedition. When his first moon rocket is launched, it vanishes without a trace. All aboard are presumed dead. The millionaire himself decides to be on board when his second rocket is launched toward the moon. What he and his crew find in outer space and on the moon are shocking scientific truths never previously thought of by even the most brilliant of Earth’s scientists. They also find themselves thrust into the middle of an epic outer space conflict! “Empire of Jegga,” while largely forgotten, is a true science fiction classic.